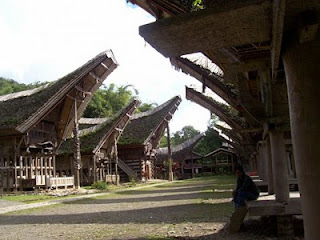 I visited Tana Toraja around 2008, within the framework of a walk while working:). Some photos are saved as a memento. 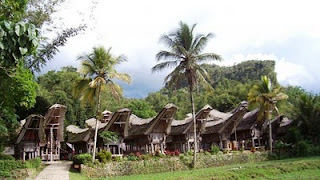 Tana Toraja has a rich culture and stunning natural scenery. The atmosphere of the mountains with terraced paddy field will pamper your eyes. Especially if the harvest comes, the yellow rice and the farmers who were working, giving the feel of its own. One of the popular culture is the traditional house, has a shape like buffalo horns. At first glance similar to the traditional house Minang Kabau tribe in West Sumatra. According to the legend told by my guide Mr. Darius Lumme, the shape of the house came from the abandoned boat, the Toraja ancestor. It has a meaning so as not to forget the history of coming, and keep track of balance or harmony with nature. In addition to the traditional house, other cultures is the famous cemetery in the cave. Bones of the body placed inside the cave after the bodies interred at the funeral home. A funeral is usually festive, it is said could cost hundreds of millions. Unfortunately when I visit there no one died :). Tourism had declined due to the Bali bombings I. Hopefully there can be revived tourism.